Get out on the water and learn a new skill! 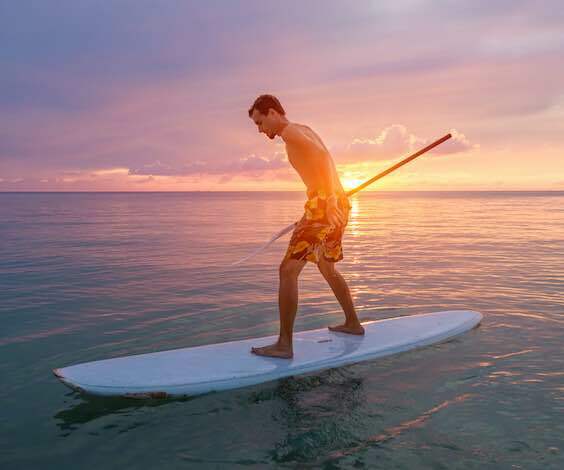 SUP – Stand Up Paddleboarding – is growing in popularity in Australia, and for good reason. It’s a peaceful and calming way to enjoy the waterways here, offers up good exercise, and lets your enjoy the views sliding past you. Try it on your Bucks party here in Airlie Beach – you might develop a new passion! Hop on ‘board’! You will be taking off from the heart of Airlie Beach, with the lads in tow, and will learn the basics from an experienced SUP veteran. Then it is off in to the yonder! This activity requires good balance, some concentration, and some core strength to master, but you can expect to fall off at least once or twice. And if not, a good, sharp jab with a paddle can help make it happen. Now get to it! Stand Up Paddleboarding is gaining momentum for a reason. It is relaxing out there! Enjoy the sun and the comradery while you tour the waterfront. The waters around Airlie Beach are rich in wildlife, and this silent method of transport lets you sneak up on them! Fish, seabirds, turtles, and more await you. You might not be the fastest, but with a bit of tact, you can knock your Buck off his board, and his high horse. It’ll be fun! For you, anyways. Keep that core tight! With a bit of sun, and the exercise of swinging that paddle around, you might find yourself getting a bit of a workout. Just in time to roll in to town looking swole af. Take that sun-dappled tan and roll it in to town! There is a big night awaiting you and the whole crew, so get amped – it is going down tonight! Bidding your best mate’s bachelorhood goodbye is the perfect opportunity to throw a ripper of a party, and Airlie Beach is an absolutely smashing spot to get it started! You have a remarkable number of daylight activities to keep you thrilled and sun-dappled, while the main strip of Airlie Beach punches well above its weight once darkness falls. The toughest part is choosing how to spend your time – as options abound! Cruise the Great Barrier Reef: You heard of this bad boy? One of the natural wonders of the world? You have the chance to experience it on this trip. A once-in-a-lifetime location for your Bucks party – what could be better than that? The Island Escape Party: The Whitsundays are one of the most incredible spots on the Queensland coast, and you have the chance to enjoy it up close! Take a day to explore these islands with the whole crew in tow. What a great look! Get a Jet Ski underneath ya: These high-powered machines are ready to take you on a solid rip around the blue waters of the ocean. This includes a beach lunch and some of the finest views out there! Airlie Beach Skydiving: Scare the living wits out of your Buck. It’ll be hilarious! Airlie Deep Sea Fishing: Does the thought of screaming reels get your pulse up? Because the waters around Airlie Beach are a primo fishing spot, and they are on your front doorstep. Get amongst it with the boys in tow! At Wicked Bucks, we put together Bucks parties in Airlie Beach that will suit you and the whole crew. No matter what kind of jam will suit our group, our expert party planners can put it all together for you! Get after us and let us plan a banger, and send your man to the altar in good form.